The women’s fitness industry is on the verge of day to day increase because of the addition of CrossFit in their competitions and workout. Also, women are fond of the benefits to perform CrossFit and are relying on it more, because it helps them get into shape, get lean and live a healthier life. Rogue’s first premium weight lifting bar was 25mm Women’s Training bar, which is highly used even today for weightlifting and CrossFit. Barbells are IWF certified, even at much lower cost which is a plus by a renowned company, Rogue. Not only the Women’s Training bar is budget friendly, but it also gives some advance features for athletes whotrain with multi-purpose bushing bars. Having a size of IWF specifications for female weightlifters, the Rogue 25mm Women’s Training Bar is constructed in the USA with all the same features as Rogue’s standard 28MM Training Bar which includes a 190K PSI tensile strength steel shaft and high quality bronze bushings. Each bar is also separately tested for straightness to within 0.015” (0.38mm).The 25mm Training Bar is a 15kg women’s barbell with no center knurl, black zinc coated shaft and bright zinc sleeves. The training bar’s single knurl marks and knurl pattern are designed specifically for Olympic lifts. 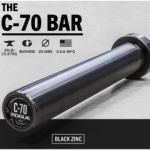 If you’re looking for a bar that is cost efficient and comes with a great design and is adjustable easily, then the 25mm training bar is a solid choice for you. The 25mm Training bar is a multipurpose 15KG barbell designed for female athletes. Fully engineered and manufactured in Columbus, Ohio, this adaptable ladies bar is genuinely optimized for Olympic weightlifting and CrossFit WOD. The 25mm Training bar is one of Rogue’s beauty to consider. The bar comes with a black zinc shaft having bright zinc sleeves. The shaft gives a perfect example of its extravagant beauty and with a heavy duty performance it’s also durable, hence expecting nothing less from a renowned company like Rogue Fitness. 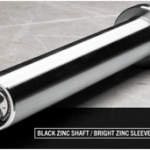 The look of zinc shaft and sleeves is simply eye warming. The bar has the ability to hold up a lot of weight, giving the exact expectations of a standard CrossFit bar. Means, maxing out the plates and throwing them on the gym, won’t have a wear and tear on the bar asthere would be on a lesser quality one. The bar consists of Olympic knurl mark, which only focuses to make the form of Olympic lifting as accurate as possible. 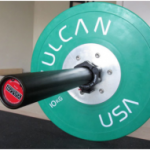 UnlikeOhio bar which consists of dual knurl marks and can support weightlifting, Olympic weightlifting and powerlifting, the 25mm Training bar puts allyour focus on Olympic weightlifting and leads you to perform the lift with correct movement and motion. Therefore, having dual knurl marks, also gives you a certain doubtabout where exactly to place your hands, but in the 25mm Training bar which consists of only Olympic knurl mark, removes such confusions and doubts by giving a single adjustable grip which is very comfortable for women. The grip is so smooth and comfortable even for the women who have comparatively shorter hands. Providing a major role in women’s Olympic Weightlifting competitions or combining events at the CrossFit Games. The weight of the Training bar is 15kg having ashaft diameter of 25mm with no center knurl, and provides the same Rogue’s standard Olympic Knurl Marks and 190 PSI tensile strength just like the 20kg Rogue’s Olympic Weightlifting bar. The Olympic knurling pattern itself gives a tight and comfortable grip on both Olympic and CrossFit workouts, whereas, the high quality US steel and snap-ring bronze bushings produce great balance of stiffness and natural switch. The Training bar is constructed with many attention and details than any other bar in the Rogue’s family.It is specifically designed for women’s weightlifting on equal grounds. While there are many women out there, who do have a competition with guys and try to lift heavy as much as their sexual-counterparts, the lighter weight Training Bar is best for the ones who want to make the sport easy and enjoy lifting by having less stress on their body. Having marketed mostly towards women, men can also benefit from them who just have started weight lifting and want to focus on their form and movement more than lifting heavy ata first go. There is a certain policy followed by Rogue Fitness to ship its equipment on the same day if they are place before noon. The bar is women’s type bar especially. Bar has a weight of 15kg. There is only one knurl mark present which is Olympic. Comes with a construction warranty with certain terms and condition to follow. 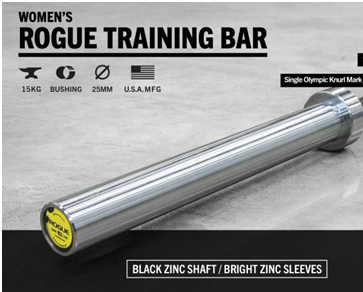 In my opinion, the 25mm Training bar by Rouge Fitness is one of the best Olympic weightlifting bars for women as it focuses mostly on CrossFit WOD to improve the form of women with comfortable lifts, high quality construction and comparatively affordable price. 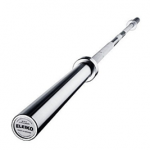 Unlikethe previous women’s bar, Bella which consisted of dual knurl marks and three type of weightlifting options, the25mm Training Bar which consists of only an Olympic knurl mark with no center knurl and greater range of loadable sleeve length to make the barbell perfect for Olympic weightlifting competitions. Though there was a certain issue my wife faced when I purchased the 25mm Training Bar for her, was the chipping of black zinc coating from the shaft. The coating is of very low quality that chips off very easily after several drops. But what I believe, if you focus more on lifting weight with a comfortable and adjustable feel than certain issues of design and looks don’t really matter. Though, the bar comes with a construction warranty, so you can address Rogue forsuch issues. 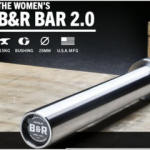 Big things short, the 25mm Training Bar is one of the best fitness equipment for women as well as beginners, and it is suggested to give this barbell a try because of its extinguishing features and benefits. Comes with a manufacturing warranty against bending or breaking. The Olympic knurl marking gives a very comfortable and secure grip. The bar is very durable because it’s engineered and constructed with high quality US Steel. Has a black zinc finishing that gives an attractive look. The bar fits perfectly in thehands, especially for women who have smaller hands. The bar is very expensive which comes in fewer weightlifting options. The Zinc coating may chip off after some time. Needs proper maintenance and care, to make the barbell look as new as possible.